PLEASE! Before you read this article, check out our guide on the 5 most common SEO mistakes (and how to fix them). These two articles work hand-in-hand to ensure your website is well optimised and able to rank in Google. Without a doubt, Google Search Console is a valuable source of information for every site owner or SEO specialist. This analytic package may be even more useful if you are aware which metrics describe your own situation on the ground most clearly. Google Search Console is a free service that helps you to garner a deeper understanding about your website and the people who use it. It will tell you how many people are visiting your site and how they are finding their own user experience. It can also tell you whether they are visiting from a mobile device or a desktop computer, and identify which pages on your site are the more popular than others. Equally as importantly, it can identify and fix website errors, submit a sitemap, and create and check robots.txt file. Google Search Console is another useful tool from the Google that helps you to better understand how well your website is working for you. Contemporary analytic tools offer plenty of insight into the performance of your website. However, wrapping your head around all those numbers isn’t as straightforward as you might think. Depending on which metrics you prioritise, you could come up with quite different ideas about the current market positioning of your project – and admittedly, various web-based projects do have divergent needs. Google Search Console is becoming the preferred analytic package for many SEO-minded professionals, there are plenty of good reasons for this trend. This is a comprehensive set of tools that allows in-depth monitoring of various aspects of website’s appearance in the eyes of the crawlers as well as human users, summing up the key stats in a convenient and user-friendly format. To make the most out of this fantastic resource, you need to know where to look at, keeping your focus on the metrics that are most relevant for realisation of your business objectives. It would be superfluous to tell you that online marketing is all about clicks – you already know that. Still, it can’t be overstated how helpful it can be to be aware of this simple indicator at all times and spot trends as they develop. That’s why Google Search Console highlights this parameter as one of the primary options for website tracking, dedicating an entire section to counting clicks. Not only you can follow the total number with ease, but you can also break it down according to multiple dimensions. In Google’s parlance, an impression refers to a single instance of a website’s link being displayed in search results to a unique user, and it is often used as a measure of campaign outreach and effectiveness. Due to extreme importance of this indicator for understanding and justifying the structure of marketing expenses, this metric is one of the most essential pieces of the puzzle that can be easily gathered from Google Search Console. As opposed to metrics dedicated to measuring sheer volume, Click-Through-Rate (CTR) attempts to gauge the appeal of the website and/or its promos on average. It basically shows you the percentage of people who liked the content enough to click on it, and as such is indicative of the success rate of your communications. On a more technical level, CTR is calculated by dividing total number of clicks with total number of impressions, so it can be viewed as a derivative of the two most basic parameters that Google Search Console is tracking. Securing a good position on the search results page is the whole point of an SEO campaign and website owners are understandably concerned how they are faring in this department. Google Search Console affords a simple way to stay on top of this kind of insight continually, as it calculates the average ranking of the best-positioned website page. Knowing how high your best-optimised pages can get, it becomes possible to adjust your SEO efforts in order to achieve better ranking. It is natural to be curious where your traffic is coming from, and this kind of information can carry a lot of financial weight for some business models. Using Google Search Console to break down the level of interest in your website geographically is a smart practice that can greatly contribute to your international success. This way you can easily identify new markets that might possess significant growth potential and follow up on the results of your global marketing initiatives. As we all know very well, Google searches could be directed to fetch web links, images or video. It goes without saying that for some websites certain searches carry more value than others, and it is very convenient to have the ability to sort out all queries according to their nature. This feature will allow you to test whether you are prioritising the right kind of content, and it will also let you study the evolution of interests of your primary users. Overall attention that a website is attracting, as well as its authority with Google’s algorithm, can be summarised through the number of inbound links. 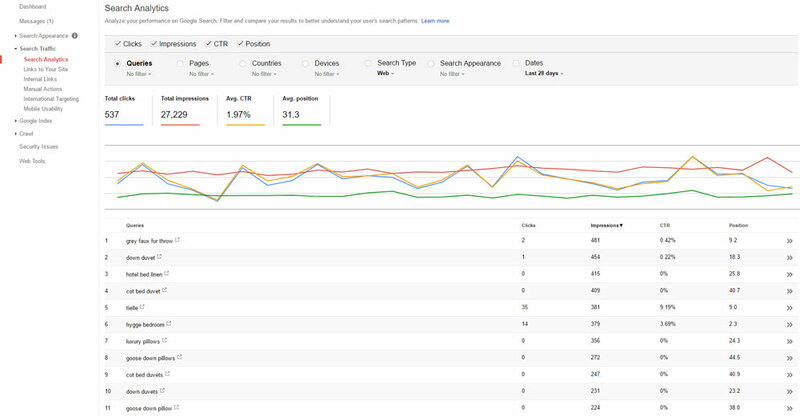 Following all the links sounds complicated, but here is where Search Console’s clearly organised dashboard really comes in handy. You can simply check total number of links at a glance, and deepen your understanding of the link structure by analysing the list of sources ranked by the number of redirects to your website. Before you go, please read this article, our guide on the 5 most common SEO mistakes (and how to fix them). Some of these fixes take minutes and can boost your rankings in a matter of days. Still puzzling over how to use Google Search Console? Fear not, our team of experts at The Content Works are here to help. 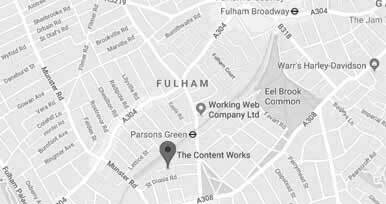 Give us a call on 0207 305 55 99 to speak to us about how we can help you better understand your analytics and identify areas for improvement to help boost conversions.